This Martini pink ribbon pin is adorable and great for all you Bunco players out there. The pin would also be great for a Las Vegas style or cocktail party fundraising evening/event . 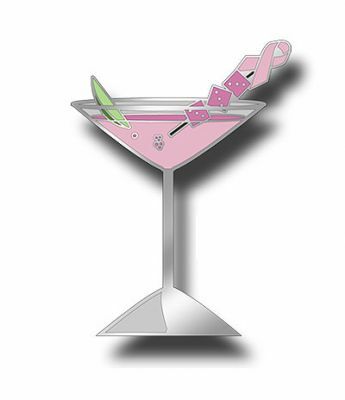 Resembling a Cosmopolitan with 3 dice and a pink ribbon on the stir stick, this pin was designed by a Pink Wings customer in California for her Bunco group! This is a 1 1/4" great quality custom Cloisonne pin. Surprise your Bunco group or cocktail guests with this adorable pink ribbon favor!